I picked up this gem of a book at a favorite thrift store awhile back from a pile of free books. I love books, and old ones are even better. They hold such history. Anyway, I was so intrigued with this one and scooped it up and took it right home. It is delightful. My sister and I enjoyed an entire evening perusing its fun pages and laughing and laughing at the author's witty writing style and her fun way of explaining calories and dieting. And amazingly, much of what is in her book is still in practice today...calorie counting, exercise, and even a type of points system similar to Weight Watchers. Fascinating. 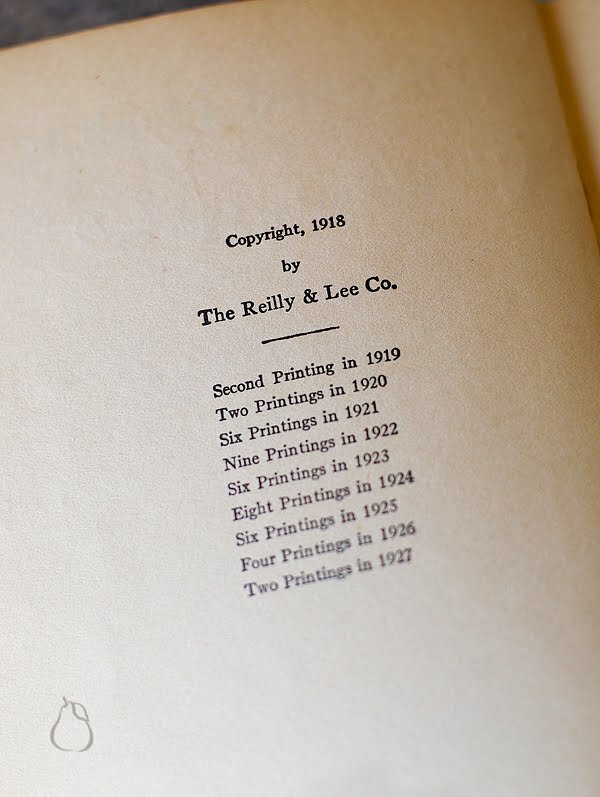 And check out when it was printed. Almost completely 100 years ago. 92 to be exact. Amazing. I guess I didn't really think about people dieting back then. "Your stomach, long used to an excess of food for your needs-- it may not be a large amount-- but still, I repeat, being used to an excess of food for your needs, your stomach must be disciplined. It is undoubtedly distended, as it should not be. A good way to show it that you are master is to fast for at least one day--drink nothing but pure water, hot or cold, as you prefer. It will protest vociferously and will tell all its friends, the different organs in your body, how you are persecuting it, and they will join the league against you and decide they will oust you from your position, and you will feel like--but don't mind it; it will soon know that you mean business, and, much chastened and considerably contracted, will take the next day a very small amount of food very gratefully. If you do not want to be so severe with it, you can allow it five glasses of hot or cold skim milk or buttermilk, one every three hours..."
Not that I want to fast like that for a whole day... but her descriptions are hysterical! "So many ask me ...Will they always have to keep it up? And it ever irritates me. The answer is, --Yes! You will always have to keep up dieting, just as you always have to keep up other things in life that make it worth living--being neat, being kind, being tender; reading, studying, loving." "You may eat just what you like--candy, pie, cake, fat meat, butter, cream--but--count your calories! You can't have many nor large helpings, you see, but isn't it comforting to know that you can eat these things? Maybe some meal you would rather have a 350-calorie slice of luscious pie, with a delicious 150-calorie tablespoon of whipped cream on it, than all the succulent vegetables Luther Burbank could grow in California. My idea of heaven is a place with me and mine on a cloud of whipped cream." Awww, a cloud of whipped cream sounds good to me too. Her exercise chapter is also hysterical...I love it. Check out the first illustration and side note. Another one of her exercises involves brushing hair "vigorously at least 200 double strokes all over the head using a brush in each hand. " 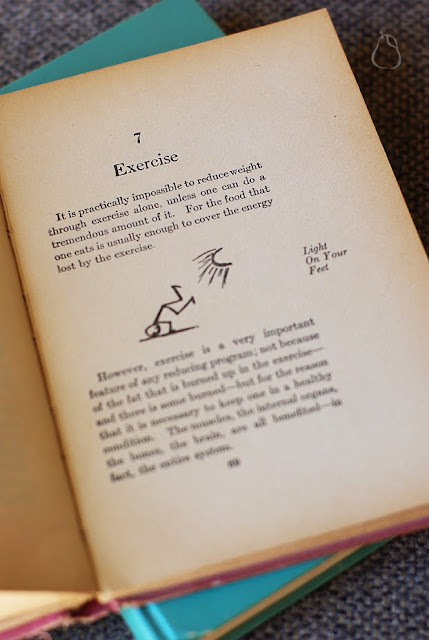 She goes on to say that "this is one of the best exercises and must not be omitted, for it accomplishes two purposes. It is a good arm and chest exercise, and it gives a healthy scalp" free from dandruff. I was intrigued with the author, Dr. Lulu Peters and looked up some information on her and her book...this is some of what I found. You can find the full article here. "First published in 1918, it sold somewhere between 800,000 and 2 million copies (depending on who you believe) and was the number 4 bestselling nonfiction book in 1923, according to Publisher’s Weekly. 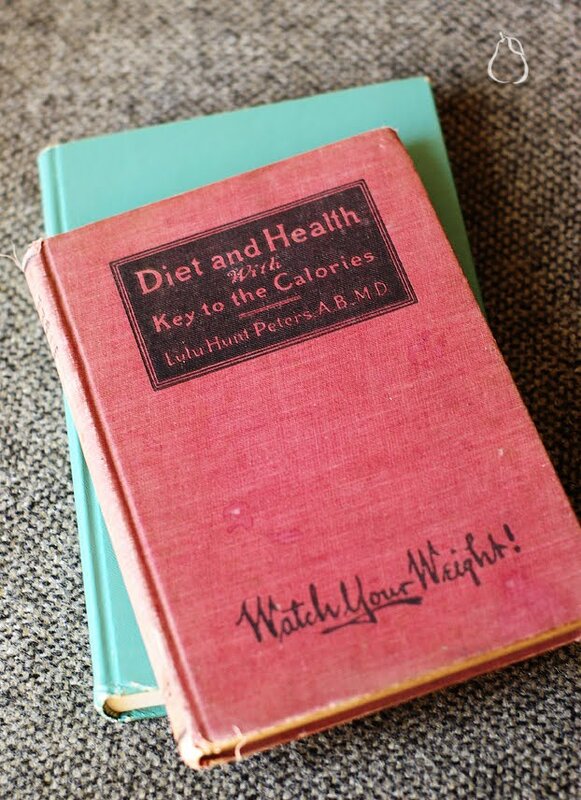 The book was Diet and Health, with the Key to the Calories, written by Los Angeles physician Lulu Hunt Peters..., who managed to lose 70 pounds using the system she described in her book: calorie counting." I love it! 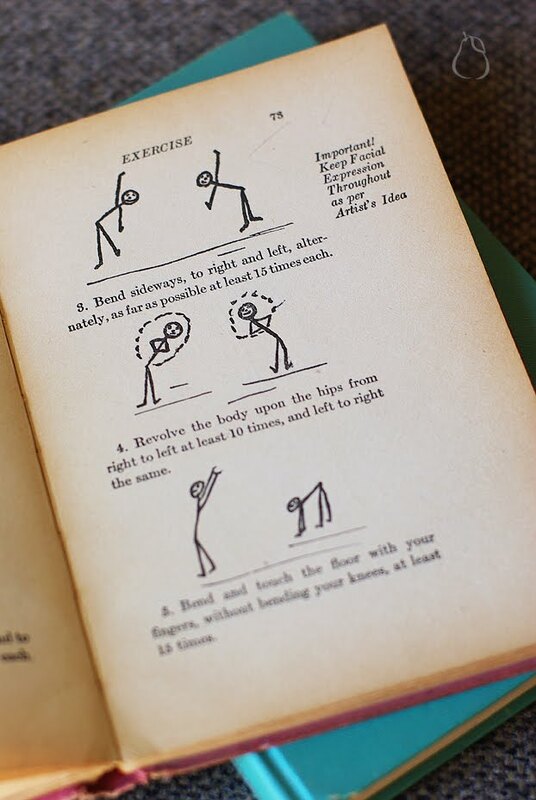 Not only is it an old book, bonus...but the whole calorie counting, and excercising. I've lost over 20lbs, and still counting. People think I'm crazy. There's all those cheats out there. But I'm opting for a life style change. So I love the part where she says, "you will always have to keep up dieting". I guess good advice stands the test of time. A gem you've truly found. Good job! Not as cheap meaning FREE! At least yours turned out better than my psycho one. Look all that youve learned. It does sound very similar to WW, FUNNY.